In the words of a famous scholar, "I made it up the mountain, and its all down hill from here." I am happy to announce I officially graduated from Luther College! This most recent J-term I finalized my senior paper, handed it in and received my completion sticker! All in exchange for my diploma, which was sent a few weeks later. To answer the immortal question facing grads everywhere, especially English/History grads: "What are you going to do next?" I finally have something to respond with. 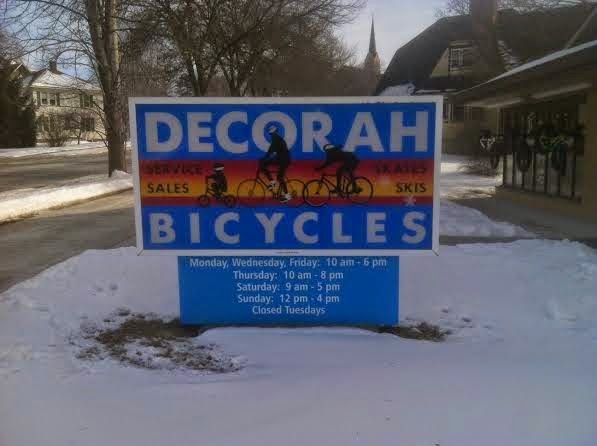 Working at Decorah Bicycles! The situation could not have worked out better. I have a great job which is incredibly pertinent to the trip, and still close to Ben, Jon, Habitat for Humanity and the rest of my buddies at Luther College. For the past few weeks I have been concentrated on learning about cranks, hubs, disc brakes, the debate between 27.5" vs 29" tires, hybrids, fat bikes and everything in between. The list could go on and on. Thus far, I have the basics down: How to change tires, grease chains and how to clean and reassemble bikes. etc. Pair that with my ever expanding knowledge of appropriate gear and trusted brands and we will hopefully have zero problems while traveling. To the End of the Earth's quest of assembling the perfect off road touring bike is one step closer to our goal. As of right now, we have several baseline qualifications for our bikes: a steel frame so it can be welded if broken, disc brakes in order to slow down the weight of the rider + 100lbs of bike and gear, dependable wheels that can support the weight and distance without cracking, and enough frame and pedal clearance to hold our paniers and gear. Overall, we need our bikes to be as ruggedly sturdy as they are simple. We need a bike capable of taking us up and down mountains, through cities, over paved and gravel trails and even through the sludge of eroding hillsides. The perfect bike has become, as Jonathan would say, "our land mermaid." Something we're all consciously looking for, but we don't know where exactly it will turn up. Keeping To the End of the Earth in mind has been more than enough motivation to keep me interested, engaged and grounded. During the trip, being able to keep our bikes happy and running smoothly, will keep Jon, Ben and I happy and running smoothly, or at least as close to that as possible. Who knows, maybe something I absentmindedly soak in will be the difference between us spending a rainy night in a ditch, stranded, deciding who to eat first, or making it on to the next town which happens to be having a Sports Illustrated Swimsuit edition photo shoot. Ya really never know. Either way, working at the shop has been and will be and invaluable experience.